“My works in themselves do not possess any special intrinsic meaning. Instead, they simply exist, incorporating within themselves random images and forms. Tranquil and ephemeral atmosphere seems empty, but acutely moves my emotions. Born in 1984 in Shiga Prefecture, Japan. 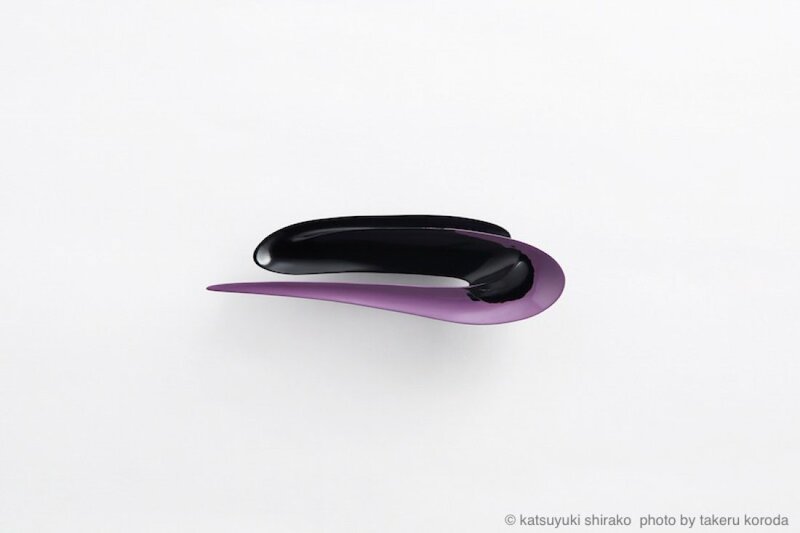 Katsuyuki Shirako graduated from Kyoto City University of Arts with MFA in Japanese Lacquer in 2010. Shirako uses Japanese cypress (hinoki), oak (nara), Japanese lime tree (shina) to form sculptures onto which he applies finest pigments and lacquer. His works are generally categorized into four series – ASSEMBLE, CONNECT, SCATTER, SCRIBBLE and JUGGLE. (Please refer to the descriptions of each series on the next page.) 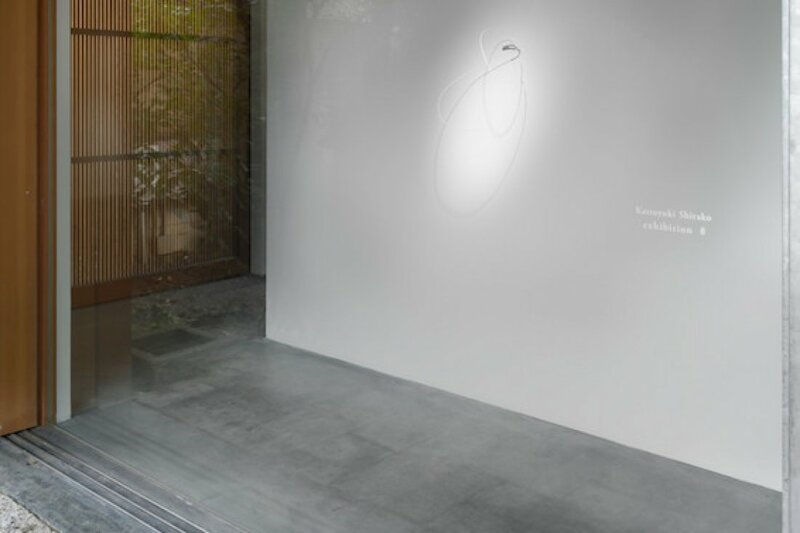 For this exhibition, Shirako challenges to create a new series (the name is not decided yet). In the new series, he curves out a block of wood, trying to express its cut-out spaces rather than the sculpture itself. Shirako never ceases his search for beauty, possessing his own determination in his everyday life that goes beyond the creation of the works in these series. He attempts to crystalize his sense of beauty by using motifs from the natural world into all genres — Ceramic Arts, Lacquerware, Painting, Sculpture, Photography. Setting all focus on the inherent, natural beauty of his works, he does not incorporate “meaning” into them. He would rather take a neutral stance that allows beauty itself take one’s breath away. 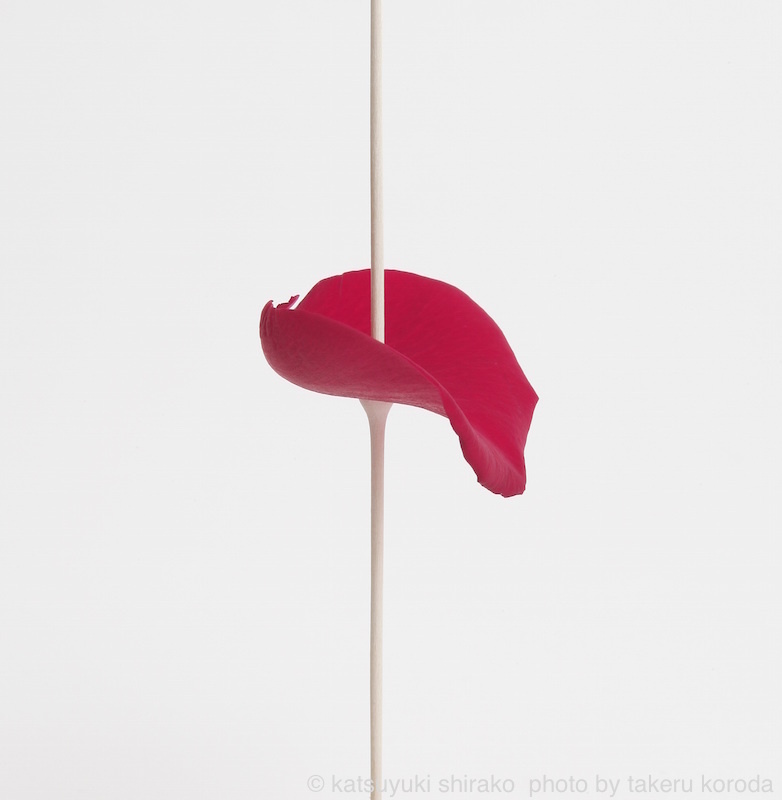 In CONNECT series, Shirako expresses, in photography, the beauty of the nature with Japanese lacquer in a unique way. He believes the balance of the nature and human being on this planet should be kept by co-existing in harmony. Instead of recreating a living object with Japanese lacquer, he combines the object in its natural form and his work made of lacquer. He photographs them to capture the transience of living things and the eternity of Japanese lacquer and to take advantages of the beauty in both artificial (in his case, it is Japanese lacquer) and the nature. In CONNECT series, their exquisite harmony is demonstrated in his photographic works. The designs of SCRIBBLE series come from hundreds of the line drawings of Shirako’s actual pencil scribbles. He scribbles at random, acting on instinct, more or less, and chooses his favorite ones. Then he presents his natural action, scribbling, in three dimensions by carving them out of blocks of Japanese lime tree or medium density fiberboard (MDF) all by hand. After being carved, each line (amazingly, all the lines are connected merely at one point) is shaved and sanded meticulously. Then he applies Japanese lacquer in different colors. Each piece requires about the applications of 20 layers of lacquer in order to create the depth and the luster of colors to complete the work. 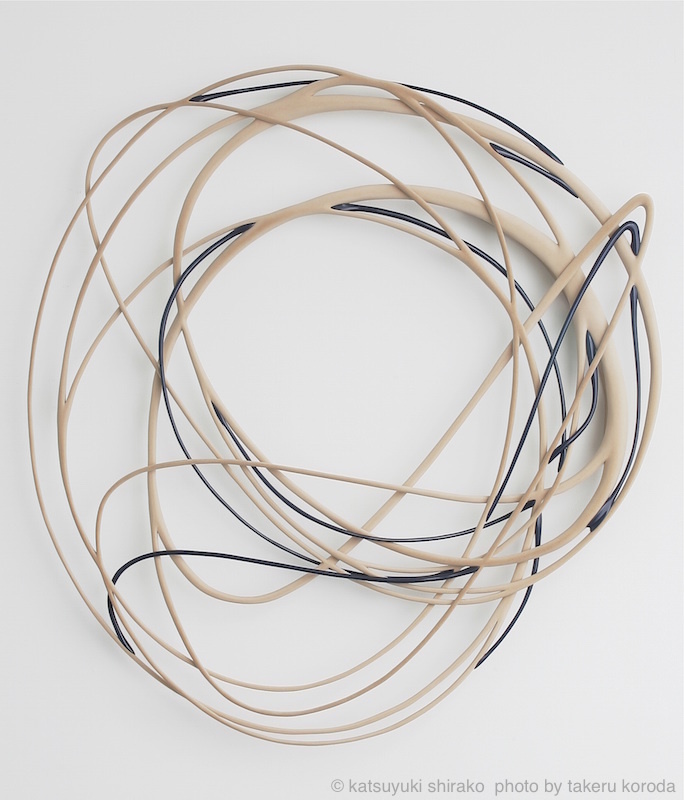 The works in SCRIBBLE series are minimalistic yet incredibly articulate. Originated from the shapes of ferns, thorns of cacti, and flower petals, the designs of ASSEMBLE series are transformed into tiny pieces. 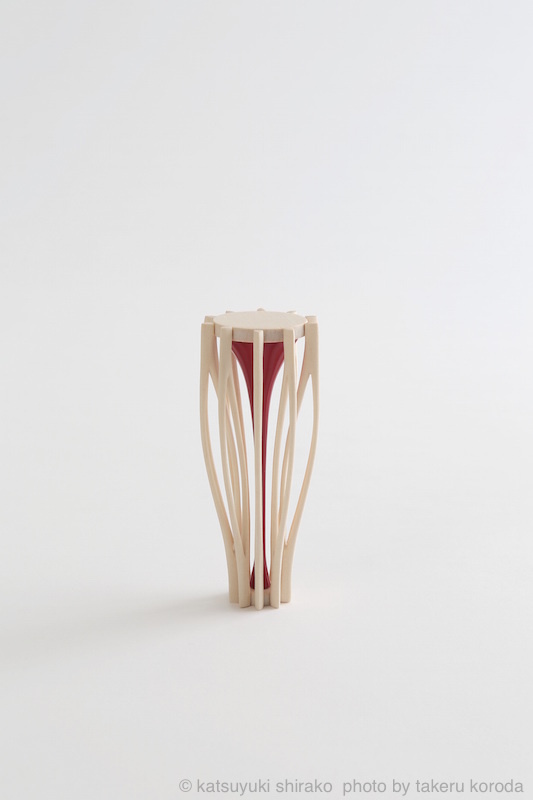 Not only each piece but also connecting parts are all hand carved, out of Japanese lime tree and/or oak, and perfectly fitted into each other. Shirako applies different Japanese lacquers in colors and shines to bring out the different textures of each piece. The complete works boast his original designs andarchitectural beauty. 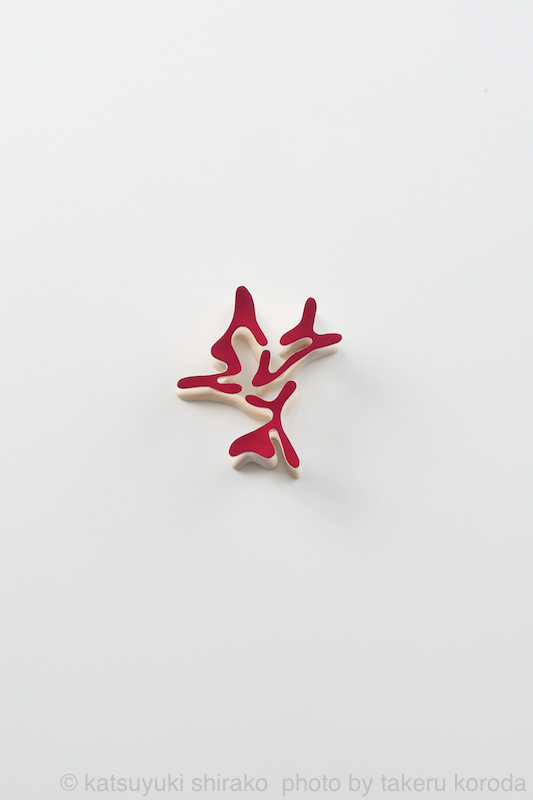 The works in SCATTER series are made of Japanese lime tree. The shapes are derived from the complex images of islands, flowers, moss, butterflies, and clouds… again things he finds fascinating in the natural world. In the SCATTER series, he applies natural pigments such as ground rocks and shells that are typically used in traditional Japanese paintings. The colors that he chooses are so subtle that they show various shades, depending on the surroundings, lighting, and the times of the day. While exhibiting these small works, he realized that their shadows become the part of the works, and began to gather them on the base to create a larger more complex works. By utilizing minimal materials with his maximum techniques, he challenges to express tranquility in the soul and flowing times that we enjoy in a small garden in a Japanese temple. 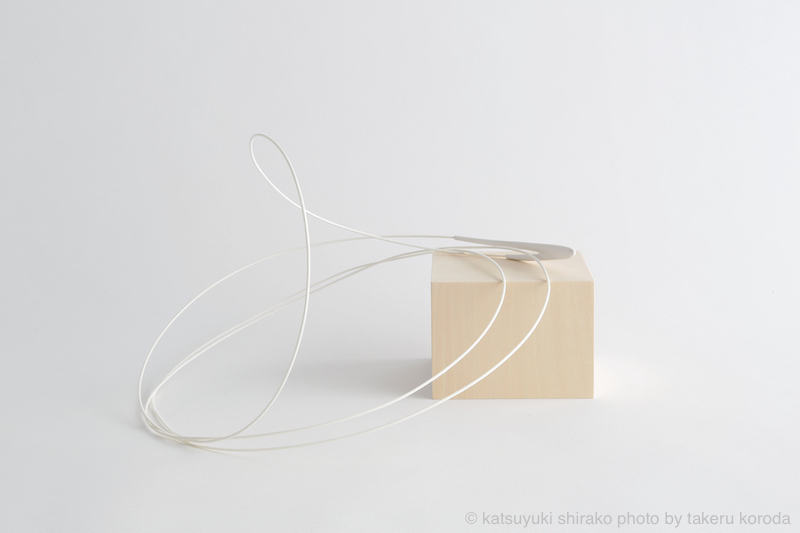 Shirako creates a wooden part with wholes where the ends of long rattan are inserted. Depending on the locations of the wholes, the shapes of the wooden part, and the climate (temperature and humidity), the rattan waves, circles, and hangs to become a beautiful sculpture.